This is an official subscription on Contract with Sky Italia SKY TV + Famiglia + Cinema + Sport + Calcio HD . This viewing card is for 12 months period unless otherwise stated. The best of Italian TV with "Sky TV" with a huge selection of your favourites TV Shows 24/7 such as Masterchef, Italia's Got Talent, X Factors. Also Sky TV provide access to Series TV programmes , Reality Programmes, Talent Shows, Documentary, Films, News and much more!!! Embrace your viewing experience with the addition of Documentary, Music and Kids ( Bambini ) channels such as Disney’s channels, Discovery , National Geographic and MTV Music channels. “Sky Italia Cinema HD” brings you 12 channels in stunning HD showing Italian and International Cinema productions without any advertisements breaks and most Movies shown on Sky Cinema HD have dual audio Italian/ English. And many more Sport events!!! 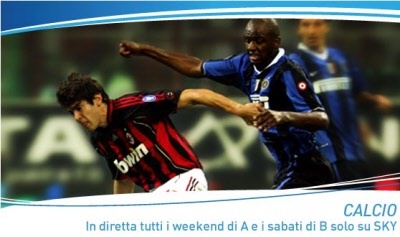 Enjoy “Sky Italia Calcio HD” with 15 channels dedicated to Italian Football. Watch all the Serie A and Serie B Italian Football in amazing HD..
Nat Geo people, Gambero Rosso HD, Dove TV, Focus, Donna e Sposa, Gambero Rosso, QVC HD, World Fashion Channel, Fashion TV, Arte HD. Super!, K2, Frisbee, Jeem TV, Baraem. Sky TG24 HD, Sky Meteo 24, TG24 Primo Piano, TG24 Eventi, TG24 Rassegne, Class CNBC, Rai News, TGCom24, TG Norba 24, TelePace HD, Roma Uno, SmTV San Marino, Euronews, Sky News, Fox News, Camera dei Deputati, Senato Italiano, CNN Intl, Fox Business, CNBC, Boomberg, BBC World News. Sky Radio, M20 TV, Radio Capital TV, Radio Freccia HD, Radio Norba TV, Radio Italia TV. Sky Sport Mix HD, Bike Channel HD, Uniresat HD, Class Horse TV, Super Tennis HD, Sport Italia, Rai Sport, Winga TV, Eurosport HD, Eurosport 2 HD, Juventus TV, Roma TV. Primafila is Pay Per View therefore are therefore not part of this subscription.. Channels and Programmes including Sport / Football events are subject to change without any notice by the broadcaster. No warranty is supplied on the card if damaged or misused - No exceptions . 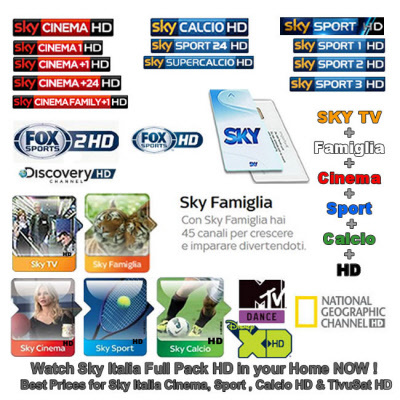 Cards are sold on the understanding that it is used in an Official SKY Italia HD Decoder. This viewing card is offered strictly for Domestic and Personal Use . Using this viewing card for Sport or Football in UK Commercial premises such as a Pubs or Sport Bars is strictly forbidden and may result in you been prosecuted by the FA , The Football Association, SKY UK and BT Sport under UK laws for Copyrights Infringements . Any prosecution will result in heavy fines and criminal records therefore please DO NOT ATTEMPT and instead use official SKY UK and BT Sport commercial contracts in your premises.